I haven’t been writing much in my blog for several reasons. First is that I’m still adapting to how everything has changed since my Father died and this blog is not a personal diary. It’s not here so I can show the world my most private thoughts. However, I’ve realized there is something that’s become a passion of mine in the past year that I have yet to write about here and it’s something I do love doing and talking about. Anyone that knows me knows I love cycling and enjoy walking and lifting weights, but that’s about the limit of any training I’ve had in movement. And yet in August I’ll be competing in tango and a number of other ballroom dances. How did that happen? What do you mean when you say the word, “Free?” In software, we have two meanings, one is expressed as “free as in beer” and the other is “free as in speech.” This applies to music as well. There is music you can download for free, there’s also music you have to pay to download. Often you can pay for music and get far less than you expect, even if the song is exactly what you want. I make my living from the results of software I’ve written. I have two LCD monitors in front of me and, when I’m working, am often logged into 3-4 computers that could be in different locations in the city or state. When I lose my Internet connection, often I have to stop working. Even if I’m on only my workstation computer, I still need the Internet for reference and other uses. Make no mistake about it: I am a true computer and network geek. On the other hand, I held out for years, avoiding Amazon and eBay. Why? I’d rather support the merchants locally. At one point I had a part time job I loved in a small retail store. I didn’t need the money, but I liked the book store, liked their attitude, and liked helping both the store and the customers. They opened a new branch store in a mall not far from me. Once I was helping two women with a lot of questions and recommending the appropriate books for each question they had. Then I said something about one being discounted. One woman said, “Oh, we wouldn’t get it here. We’d get it on Amazon.” To this day I regret that I didn’t say, “Then see if Amazon is here to help you and patiently answer all your questions in six months. If we’re gone then and you have questions, you’ll know it’s because people bought from them and not us.” I didn’t say it because I didn’t want to prejudice their view of a store I believed in and I didn’t want to hurt the reputation of the owners. Interestingly enough, within six months, that branch store was closed due to lack of sales. I’ve been dealing with email before most people ever heard of email, computer networks, or even the Internet. I remember getting emails about the government considering modem taxes before most people knew what a modem was and while some tech people were still making fun of me for using a modem and connecting to networks. Many of the people I know through the Internet are techies. They tend to respond to emails the way I do, with interspersed comments, no HTML formatting or anything else at all fancy. I also have friends I’ve met through the Internet that barely know more than to log on to their computer don’t understand where their computer ends and the Internet starts. One thing I like about Richmond is that it’s on the James River and does, sometimes, get called “River City.” Of course, River City is much more famous when applied as a name to a small town in Iowa where Professor Harold Hill ran his last scam as he tried to tell them that “that game with the fifteen numbered balls is the devil’s tool” and that they needed a boys band because “you gotta find a way to keep the young ones moral after school.” Of course I’m talking about one my favorite musicals, “The Music Man.” I love the movie with Robert Preston and Cary Grant and every time anyone does it as a play in the area, I make sure I go see it. I was recently emailing back and forth with a friend about the movie and how it looks like just a “fluff” piece, a musical that’s fun but has no depth, but I think there is much more to it than that. I wanted a 380SL for several reasons. The biggest is that I’ve always wanted a convertible so I can enjoy driving around in the summer with the top down and feel the wind and sun. 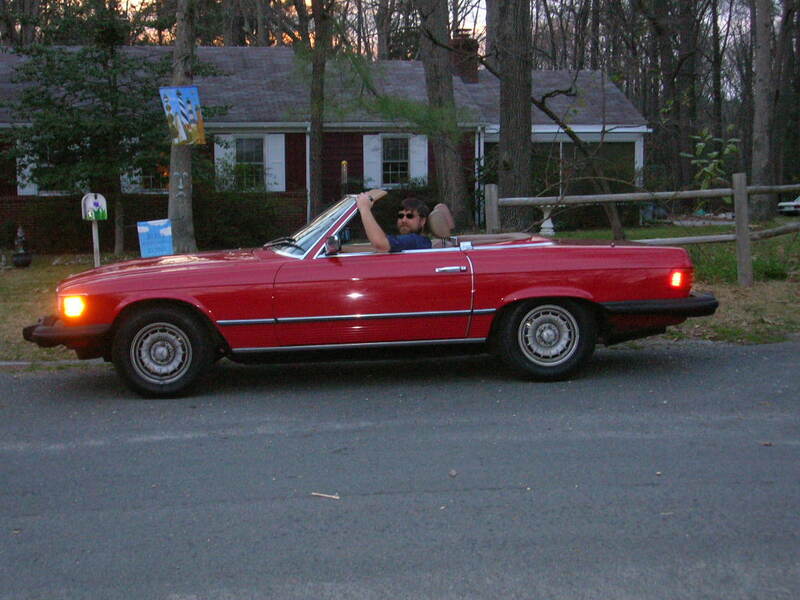 Of course, though, if you’re going to have a convertible like that, two things that really help make it more fun to drive around with the top down are a fun, pretty, intelligent woman in the passenger seat and a radio for good music. I can’t really give anyone advice on how to find the former, since that’s an individual’s choice, but I can add a little about what I had to do with the latter and how I got a radio/CD player working. I haven’t had time to post much lately and I still have a fair amount to catch up with regarding car restoration and repair work. There were several details to take care of that are simple enough to not rate a post on their own. This includes fixing the antenna, dealing with new keys, taking care of the air conditioning, putting in a couple trans mount bolts, and fixing the interior lights. 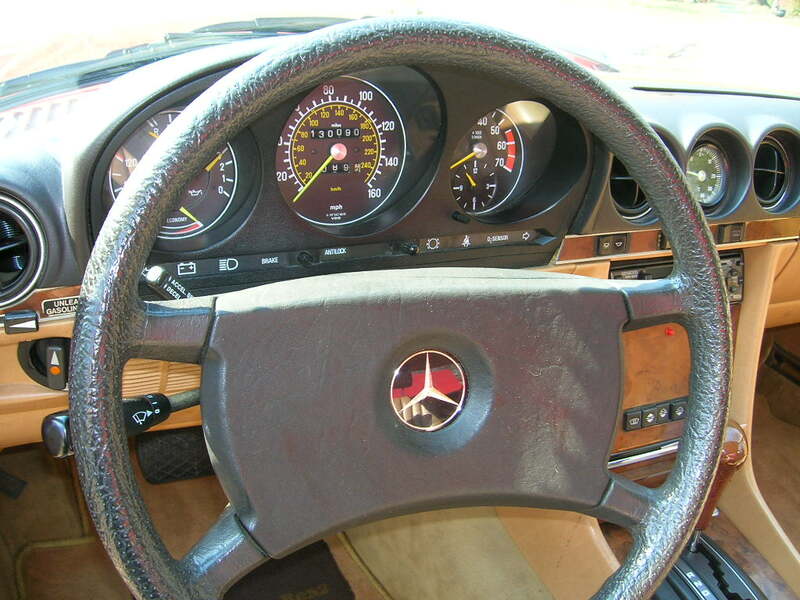 While these are simple, again, I’m blogging all that I do to this car for a couple reasons. One is selfish, so I have a record of everything I’ve done and I know if I’m the only one that reads it, I won’t have motivation to write it. The second is because the Internet community, as a whole, as been a huge help to me. I don’t think I could have started my business and gotten it running if it were not for the help I’ve gotten from people, literally, all over the world who gave me advice in email, on IRC, or through instant messages, about programming or dealing with technical software. While the people working on classic cars are not always going to be those who help people like me with software advice, the people I’ve dealt with on the web have been very helpful when I’ve asked questions about fixing or restoring cars. I’ve already been told, several times, that my posts on the fuel line and the low cost hoist I made for my roof have helped people. With that in mind, let’s look at these small details I’ve had to fix.